DirectPCR® DNA Extraction System is a single-tube system for rapid preparation of DNA from mouse tails, ear pieces, yolk sac, and culture cells. The patent-pending components developed by scientists at Viagen Biotech Inc. allow the resulting DNA extracts to be compatible with genomic PCR for genotyping. Crude extracts of biological samples are not compatible with many molecular biology-grade reactions such as polymerase chain reaction (PCR), in part due to inhibitors contained in crude extracts. The DirectPCR reagents not only mediate the rapid lysis of biological samples but also contain inhibitors that effectively suppress the inhibitory activities of crude lysates for PCR amplification, while maximally maintaining the integrity of released genomic DNA. The patent-pending simple procedure completely eliminate any solution transfer or tube-opening steps, providing you with substancial extra time. 1. 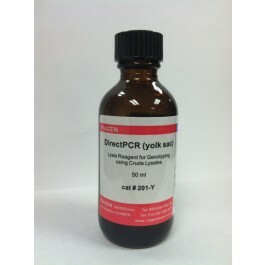 Lyse tails in DirectPCR® Lysis Reagent. 2. Incubate for 45 min at 85°C. 3. PCR genotyping with 1 ml lysates. Detailed protocols: Tail, Ear, Yolk Sac, and Cultured cells. · Time saving: Virtually no hands-on time. Crude tail lysates for PCR! · Safe: No organic reagents. · Reliable and efficient: Virtually 100% success rate with high yields.